It's that time again! Let's give a hearty roud of applause in celebration of some notable kills taking place between March 10th @ 00:00 EVEtime and March 16th @ 23:59 EVEtime. First we have Jon Horton's Orca, which met its fate while aiding an illegal mining operation in the Otela system. An anti-tanked Orca in a 0.5 system is not necessarily the best of ideas--he may have been emboldened by mining so many jumps away from our current set of HQs. But are a few extra jumps going to hold back the tide of New Order justice? Cymoro, Currin Trading, Fawn Tailor, John E Normus, Wescro2, NoseCandy, Dr Tyler, Pestario Vargas, Lady Areola Fappington, Jackee Sparrow, Talia Andrade, and Renyah Atori say "hell naw!" With a few extra seconds to spare, Fawn Tailor discovered that Jon Horton had a nice little pod, as well. What's this, then? Sharon Kusoni learned a valuable lesson: The New Order is sometimes inclined to kill more than one Orca per week. She was dispatched by Jameson2011, Capt Starfox, Ziaeon, Galaxy Pig, Diabolical Fullmoon Mysticism, Sara Angel, NoseCandy, Banzai Banana, Kypermethrin, laassaalos Kiblos, and Renya Atori. Bonus! You can watch enterprisePSI's video of the aforementioned Knights killing the aforementioned Orca: Video. How about that? A third Orca killed this week. Sotkenn Sotken holds the distinction of being the first Orca pilot to lose his ship to Code violations in a 0.7 system. There was plenty of DPS available for this kill, thanks to John E Normus, Ziaeon, Dr Tyler, Nardieu Nardieu, Capt Starfox, NoseCandy, CapBaby IX, Pestario Vargas, Lin Suizei, Sabriz Adoudel, Kypermethrin, and Talia Andrade. Is nowhere in highsec safe from our Knights? Fantosmagoria found out the hard way that the answer is most certainly not! 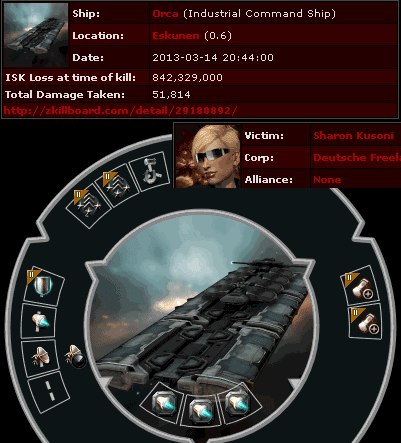 He lost his Mackinaw while mining Veldspar in a 0.9 security system. Crime--even if it's petty--does not pay. Our heroes had minimal time in which to perform their task, but it was just enough. Nardieu Nardieu, Cymoro, Capt Starfox, NoseCandy, Dr Tyler, Renyah Atori, and Wescro2 killed the Mack; Jackee Sparrow stuck around to kill the pod. OK I'm fairly noob (~2 months playing) and I know 2 expanded cargo holds on a ship where most of the EHP is hull is a bad idea. 3 large cargo optimization rigs didn't help. I wonder if those 3 AIF2's were even running lol. 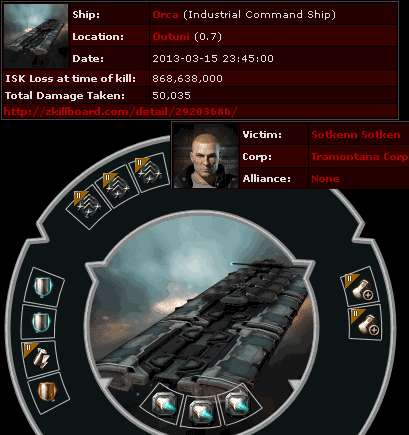 Bigger LOLs for the 2nd orca with civ shield booster. err 3rd orca, but the 2nd one is pretty fail fit as well. The civ shield booster is all about tanking rat damage in the belt ... i.e., another untanked orca. Putting cargo extenders and cargo rigs on an Orca IS insane. They do not effect the ore hold capacity in the slightest. They just allow you to stuff a little more ore in the cargo and corp holds, so you can AFK a bit longer. not even the corp hold. The proper way to write that in English is "non-English speakers". 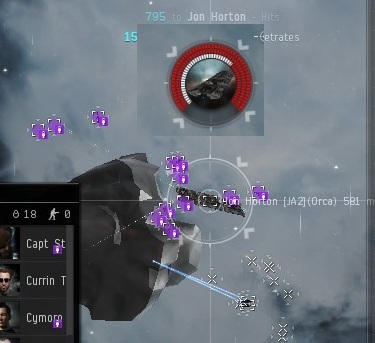 All I see is people without a life and the guts to fight in low sec, venting their frustration on the high sec miners. I've done my reading, and I honestly hope this James guy is just ACTING like a complete sociopath, because if he isn't I would be worried for HIS family and children, although it's obvious he doesn't have any, since he's too busy spending his life on EvE. I hate mining, never even BEEN in an asteroid belt, and still I think you guys are just a bunch of pirates trying to make easy money praying on those with very little experience (and that's why you go in high-sec, because the new players go mine there). As I said, go in low sec and try your strategy again. I can't wait to meet one of you pirates, honest. Ah, also, I don't care if my English isn't perfect, it's not my main language and also it's very hard for me to try to please some racist no-lifers. "I hate mining, never even BEEN in an asteroid belt, "
So you admit you have no idea what you're talking about, having never even visited the area you're talking about, but you're perfectly willing to come up with elaborate theories and insults anyway. I have been in hisec belts, and they're not filled with newbies, they're filled with people afk multi-boxing 10 old accounts mining, bots, and foul-mouthed people much like yourself. If you ever decide to see for yourself what they're like, instead of just blathering on in ignorance, you'll either get angry at the afk-multi-ers and botters and join the correct side, or you'll find kindred spirits in the angry cursing rebels, and join them on the wrong side. Either way, at least you'll have chosen based on knowledge and experience, instead of random guesswork. "As I said, go in low sec and try your strategy again. I can't wait to meet one of you pirates, honest." 1. Challenge people to come fight you in lowsec. I don't really feel like subscribing to this blog, I'm sorry, this is why I post as Anonymous. I know how things work in high-sec, don't you worry. Unlike you or your "Messiah" I always tend to know what I'm saying. I know people go afk and mine with their alts, and I also know that people like you spend their time blackmailing them. Furthermore, your "Code" is one of the most riddicolous thing I've ever read. I might understand the 10 mlns fee you ask, is a way to make money like any other, what I don't and never understand is why you ask people to tell you "gf" when you suicide gank them with ships fitted to fight vs ships fitted to mine. I say gf when I fight my peers, not when some wanna-be pirate comes and ganks me when I'm afk. You are the lowest kind of people, even if it's just a game, you act and speak like close-minded hypocrits. People like you ruin EvE and ruin the world too. Just because some guy says he's going to give you a purpose in a Sandbox, doesn't make him right. What saddens me is not the fact tha James is mental, but the fact that other people are allowing him to do what he does, and even worse, help him. 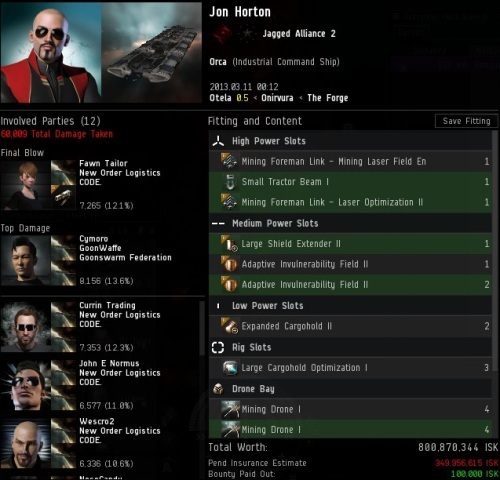 All of you probably had some big fancy mining ship, and one day a pirate ganked you in low sec, you lost billions, and found out about James and his NO, then joined him, simply because you lack the ability to stand up and fight when you get taken down. I repeat, it's just a game, but I'll be in high sec these days, and I will show you the difference between ganking a miner and fighting a ship fitted to do so. Anonymous has to be a troll. I have too high an opinion of humanity to believe that anyone is actually this dense. At least the New Order has the guts to actually play Eve. Unlike the AFK miners. ive never had some big fancy mining ship. mining lasted about 2 weeks before i found a source of income that didnt require me to be forever alone. been ganked in low once, but lost very little. i found James and the NO by paying attention in local chat, and i joined him simply because hes right. 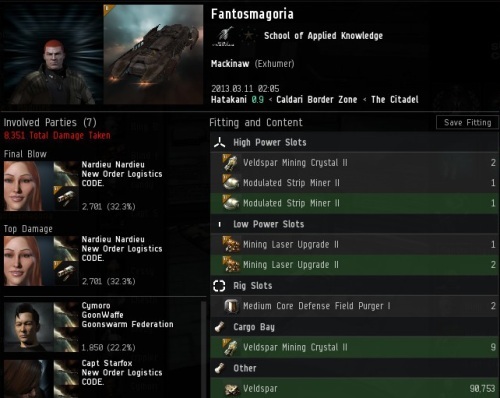 feel free to post where in highsec you will be, and when...just like we do, youll find out that most of us are trained to fly more than cats and will be happy to "gf" while we loot your wreck. Perhaps, at last, we are going to meet a 'powerful friend from lowsec'! They ask for a gf in local because they do actually think it was a good fight. Look at all the crowing they do over killing a non-combat ship with 10 combat ones. 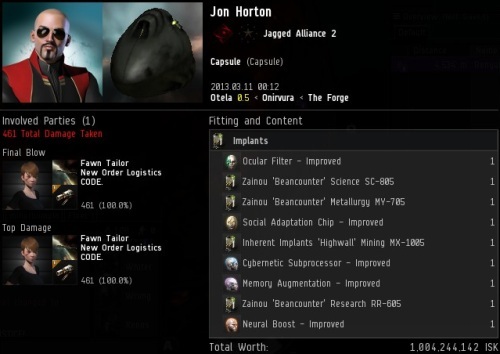 They really do think this is the pinnacle of EvE. And that is why I shall never vote for James315 in the CSM election. I want challenging & fun combat against similar opponents, not the type of "combat" that James and the new order love so much. Right it was exactly as you describe, 10 combat ships vs one non-combat ship. So what if it has more tank than a fit battleship? And, whoever said anything about an invincible fleet of NPC police ships that kill any aggressor in 10 seconds was just not reading this non-challenging fight correctly. "Look at all the crowing they do over killing a non-combat ship with 10 combat ones. They really do think this is the pinnacle of EvE." You'd have been asked to leave the New Order otherwise! "...you'll either get angry at the afk-multi-ers and botters and join the correct side..."
One does not need to join/support NO in order to be against botters. 3 Orcas this week... Whalin' erryday. It never ceases to amaze me when I'm shooting fish in a barrel and the fish still manage to act superior. Actually, that analogy doesn't even hold, seeing as how you choose to be fish. Keep on going out of your way to emphasize "combat ships vs carebear ships grrrr!!!1!" surely someone will care eventually. In the words of the Savior, you may have no interest in combat, but combat has an interest in you. For every frustrated kid you post on this blog using sarcasm and all the means the weak uses to prove a point, there are 10 experienced players who don't even care about you and your sensless Order. I care so little, I thought I'd let know!